away from it all! 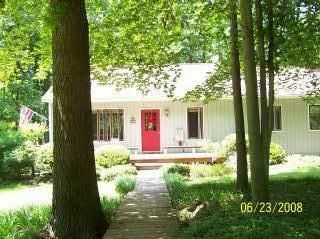 The home is nestled in the woods with approximately 100' of waterfront directly on Lake Anna. Since this home is located on the private or 'warm' side of Lake Anna, you will have the opportunity to enjoy the water early in spring and late into the fall. In August, the water does get warm, however, a short boat ride to cooler portions of the lake will help to cool you off on those hot summer days! The private side of Lake Anna is considerably quieter than the public side. You will find that on most days, there is very little boat traffic and you will feel as though you 'own' the entire lake. Turtle Cove is a lake front home, on the private side of Lake Anna. The home is located on the water, with a boat dock and boat house as part of the property. The water can easily be viewed from the house. Turtle Cove comes equipped with a dishwasher, washer and dryer and plenty of space for the family. The home has 1 master bedroom with a king bed and and full bath. There is also another bedroom with a queen sized bed and a 'kids room' with 2 sets of bunk beds. In the living room, a sofa bed converts to a queen sized bed to sleep 2 comfortably. Please bring your own linens and towels. There is a cozy back deck overlooking the lake, as well as the boat house/dock to use. The boat ramp is one block away and from there you can launch your boat at no additional cost. Turtle Cove offers 'the Barn' with a separate recreation room with a pool table, TV and kitchenette in a separate unit. Above, you will find a bedroom suite with a double bed, futon that converts to a double bed, full bath, and a small living area. THERE IS NO INTERNET, WIFI, CABLE OR SATELLITE TV. Television channels are local antenna channels only. Perfect for our family Thanksgiving. There were 11 of us. Plenty of room and plenty to do. No complaints with this family friendly rental! We were 2 families with young children traveling together to enjoy Lake Anna in the fall. The property was very quiet and secluded. Being on pond 1 in late September was perfect! The water was 90 degrees and we were able to enjoy lots of boating. We just wished the dock was not so shaded but we made the most of it. The hosts were very quick to respond to any questions we had and very polite. We super appreciated all the help! Overall the house was adequate. It probably could use a deep cleaning. There was quiet a bit of dust, some mildew in the master shower area and worn out rugs. Also we found mouse poop in the clean, put away dishes. I totally get it though...the house is in the woods. Don't get me wrong though, the house was spacious and perfect for out needs. The kitchen counter space is a bit limited but we easily adapted. If you are not overly picky then I would definitely recommend this place! We had a great time, and made use of the boat and canoe. The deck provided a great view of the lake and the barn had a fun game room. Would definitely revisit if in the area again. I will reiterate what other people have posted in the fact that the warm side of the lake in the month of August is extremely warm. The water in lagoon 3 was 96 and by the dock of the house was 100. It was jacuzzi water. It was a nice halfway point between families to enjoy some rest and relaxation together. The house and property is even better in person! We had 10 adults and 2 dogs and had plenty of space. The only place we bumped elbows was in the kitchen, but each family took turns making dinner so it wasn’t a big deal. The paddle boats were a hit and being on the cove was perfect for the kids to play around in the water with no boat traffic. The pool table in the barn only had one working pool stick and the fuse ball table is wobbly. We’re already talking about going back next year! The house had everything we needed and more. There was plenty of space to accommodate everyone. John and Kathryn were very responsive and great to work with. movies, books or board games. Spend the afternoon in the 'Barn' playing pool or watching your favorite DVD's. You'll always find something to do at Turtle Cove! Local channels only are offered on the TV in the house. There is no cable or WiFi access. Charlottesville, Fredericksburg and Richmond are all within an hour drive from Turtle Cove, so take an excursion and see some local sites! Wineries and breweries are also a fun way to spend an afternoon in the area. Primary renters must be 25 or older. A $300 security deposit will hold the reservation, with the remaining balance due 10 days prior to your stay.